The latest missile test by North Korea, its furthest-reaching yet, has split world powers who united behind new UN sanctions just days ago. US President Donald Trump said he was more confident than ever of America's military options, should one be needed. China earlier accused the US of shirking its responsibilities, while Russia called US rhetoric "aggressive". The UN Security Council has unanimously condemned the missile test, but no new sanctions have been announced. 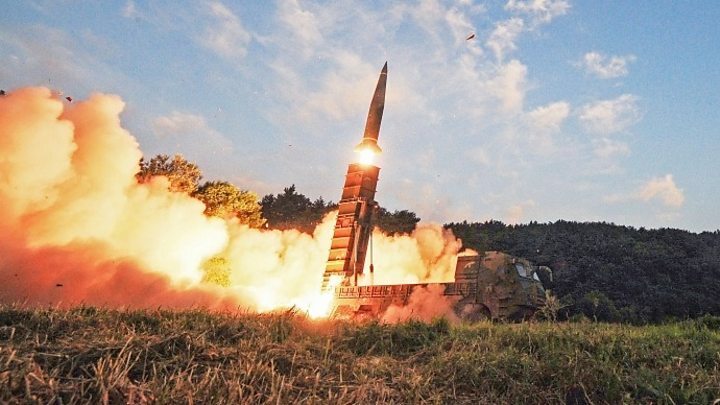 The missile was fired over Japan and reached an altitude of about 770km (478 miles), travelling 3,700km past the northernmost island of Hokkaido before landing in the sea, South Korea's military says. The missile had the capacity to reach the US territory of Guam and experts say it is the furthest any North Korean ballistic missile has ever travelled above ground. Are missiles a risk to planes? The Security Council convened an emergency meeting, in which members unanimously condemned the missile launch as "highly provocative" - coming as it did after Pyongyang's nuclear bomb test on 3 September. US envoy to the UN Nikki Haley had earlier played down the possibility of further punitive action, saying fresh economic sanctions agreed by the council on Monday that restricted oil imports and banned textile exports would cut trade with North Korea by 90%. President Donald Trump is due to address the UN next week, as well as meet the Japanese and South Korean leaders. What accusations are being traded? The missile test has been widely condemned, with Japanese Prime Minister Shinzo Abe saying his country would "never tolerate" such "dangerous provocative action". President Trump said North Korea had "once again shown its utter contempt for its neighbours, and the entire world community", but that he felt more confident than ever that the US was ready should a military option be needed. But world powers were divided over how best to respond. President Trump's National Security Adviser HR McMaster earlier said the US was quickly running out of patience for diplomatic solutions, adding: "We've been kicking the can down the road, and we're out of road." He confirmed that there was a military option, but it was not the president's preferred choice. But Russia's ambassador to the UN Vasilly Nebenzia urged caution, saying: "We think that threats, tests, launches, and mutual threats in fact should be stopped, and that we should engage in meaningful negotiations." China foreign ministry spokeswoman Hua Chunying insisted her country was not the "focal point of the conflict" and directed the following remarks at the US and South Korea: "Any attempt to wash their hands of the issue is irresponsible and unhelpful for resolving the issue." Russia's foreign ministry spokeswoman Maria Zakharova said: "Regrettably, aggressive rhetoric is the only thing coming from Washington." Why does this new test matter? 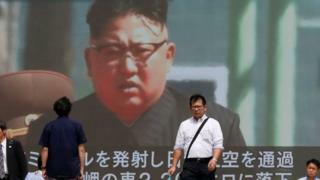 The launch took place from the Sunan district of the capital Pyongyang just before 07:00 local time (22:00 GMT on Thursday), South Korea's military says. Sunan is home to Pyongyang International Airport. As with the last test on 29 August, the missile flew over Japan's Hokkaido island before splashing down in the Pacific Ocean. Sirens sounded across the region and text message alerts were sent out warning people to take cover. Observers say it is likely to have been an intermediate range ballistic missile (IRBM) though Japanese officials believe there is still a possibility it was an intercontinental ballistic missile (ICBM). What is so alarming about the new launch is that the US Pacific territory of Guam, which North Korea says it has a plan to target, is 3,400km from Pyongyang, putting it within range of the latest missile. The North's sixth nuclear test reportedly involved a miniaturised hydrogen bomb that could be loaded on to a long-range missile. Have North Korea's missile tests paid off? How is South Korea responding? 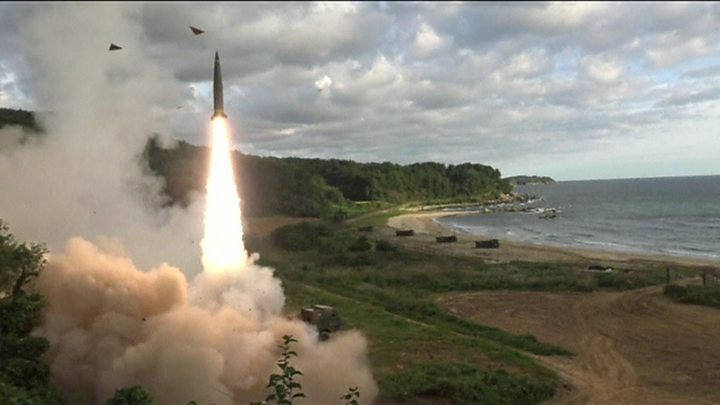 South Korea responded within minutes by firing two ballistic missiles into the sea in a simulated strike on the North. At an emergency meeting of his national security council, President Moon Jae-in said that dialogue with the North was "impossible in a situation like this". Officials have been ordered to prepare for possible North Korean chemical, biological and electromagnetic pulse (EMP) attacks, a presidential spokesman said. North Korea has said it has bombs capable of sending EMP shock waves, which would disrupt power supplies, although the claim has been greeted with some scepticism. The country does have an extensive chemical arsenal and may also have biological weapons. What damage could North Korea do? Can the world live with a nuclear North Korea? Why is the North acting like this? It insists it needs a nuclear-weapons programme to ensure its survival and there has been no let-up in its fiery rhetoric. On Thursday, it threatened to "sink Japan and turn America to ashes". A commentary in North Korea's state-run Rodong Sinmun newspaper, published after the latest missile launch, accuses the US and South Korea of conducting "ceaseless" exercises as a provocation. Watch:Was your T-shirt made in North Korea? 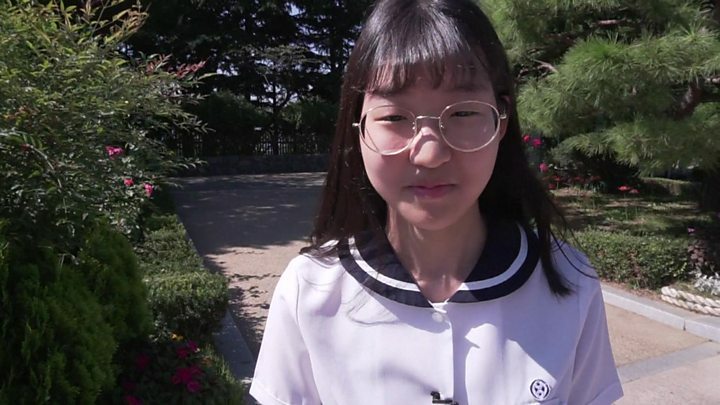 What's life like on the border with North Korea? Media captionHow could war with North Korea unfold? North Korea: How are countries defending themselves?